Tarzan's Quest is, I believe, the last official appearance of Lady Jane Greystoke, née Porter, and what an appearance it is. She's swinging through the trees, commanding an expedition, confronting a murderer, and killing an angry leopard with her handmade bow and arrows. She has come a long way from the fainting victim of the first books or the sedate matron of the middle ones. She has really come into her own and I applaud Edgar Rice Burroughs for letting her grow into a suitable mate for my her beloved Tarzan. The story runs in two parallel lines, one following Jane and one following Tarzan. On the Tarzan side, he is helping the Waziri track down Muviro's daughter who has been stolen by a mysterious band of white men. Little Nkima plays a pivotal role in this story and that is always fun. I love how sweet Tarzan is with his pet monkey, it's the one time we get to see the softer side of the big man. Meanwhile, Jane, after a delightful interlude with Hazel Tennington back in civilization, has joined an expedition to the heart of Africa with an older American friend who has remarried a "Prince" after being widowed and left a rather large fortune. (Wow, I sure packed a lot into that one sentence, didn't I?) Her old friend (with emphasis on old) is chasing after rumors of an elixir of youth and Jane is just along for the ride since she was going back to Africa anyway. Not to spoil anything but Jane's party is caught in a bad storm and, after losing his way and having no idea where they are, the pilot manages a safe landing in the top of some jungle trees. The party votes Jane in charge after some tension between the Prince and the pilot. That was pretty progressive for a book written in the 30s. Things take a turn from bad to worse when conflict erupts into murder. Tarzan, meanwhile, gets caught up in some tribal trouble when the Gomangani think he is one of the mysterious white tribe that has been stealing their girls. 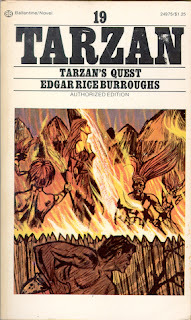 Eventually, all parties converge, as they always do in typical Edgar Rice Burroughs' style and I hope it won't spoil the book for you, but Tarzan returns just in time to save the day. I love that Jane is so tough and capable in this book. She's not waiting around to be rescued and she's not letting the men take care of her. She's hunting, she's making decisions, she's running the show. Does she need some help at the end of everything she can do? Sure, but it's not Jane's Quest, is it, it's Tarzan's Quest and he is entitled to some heroics. This is the best Jane book of the entire series and also the first time she has shown up in something like 10 books. I also believe it's the last one she appears in. As a teenager I didn't care what happened to Jane, I was too enamored of Tarzan to care about anyone else, with the exception of Korak - or Tarzan, Jr. if you will. As an adult woman with 30+ years and thousands of books behind me, I have a slightly different perspective and I have to say that this book was a lot more enlightened than I expected. It's not perfect and still has racial issues, but it's a lot less misogynistic than some of his other books. Edgar Rice Burroughs actually had quite strong women in his books - La, Dejah Thoris, Meriem, and the Moon Maid all stand out as good examples, however until this volume, Jane Porter was the prime counter-example of the helpless victim who is more of a MacGuffin than a fully fleshed character. It was wonderful to see her progress as a character and a person. Tarzan gets some really cute moments with Nkima and that helps round him out, too. In some of the later books he tends to become too emotionally removed to care about, but Nkima alleviates that and gives him his humanity back. I think that ERB got a little too concerned about making Tarzan the Lord of the Jungle and forgot to let him be a person, too. I love me some demigod action, but I miss the kid that hunched over picture books and taught himself how to read. Nkima softens him around the edges a little bit and makes Tarzan more accessible. If you read the first six books in the series and skipped to this one and stopped, I don't think you would go wrong. Not that you shouldn't read the others - except Tarzan and the Ant Men, which is an abomination - it's just that those adventures don't show the character growth that these others do. I'm really enjoying this literary adventure and revisiting my teenage favorites. 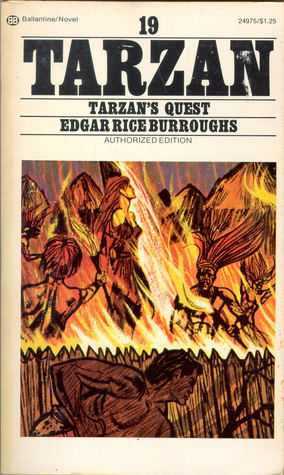 If you are inspired to read Tarzan or any other books by Edgar Rice Burroughs because of my reviews, be sure to let me know. Unless you hate it, then we probably should go our separate ways. I give this one a solid five stars.